Florida’s top elections official abruptly resigned after a newspaper obtained pictures of him in blackface dressed as a Hurricane Katrina victim at a 2005 party. The revelation is a blow to new Gov. Ron DeSantis, who has been trying to bridge racial divides after a bitterly fought election against a Democrat who was seeking to become the state’s first black governor. The Tallahassee Democrat obtained pictures taken at a Halloween party 14 years ago that show Secretary of State Michael Ertel in blackface while wearing earrings, a New Orleans Saints bandanna and fake breasts under a purple T-shirt with “Katrina Victim” written on it. The photos were taken two months after the deadly storm ravaged the Gulf Coast region and eight months after Ertel was appointed Seminole County supervisor of elections. The newspaper hasn’t said how it got the photos or identified the source. Ertel, who had been on the job less than three weeks, resigned just hours after he testified about election lawsuits before a state legislative committee. He didn’t immediately respond to a message seeking comment. The Republican was the elections supervisor for Seminole County until last month, when DeSantis picked him to take over the state department that oversees elections. 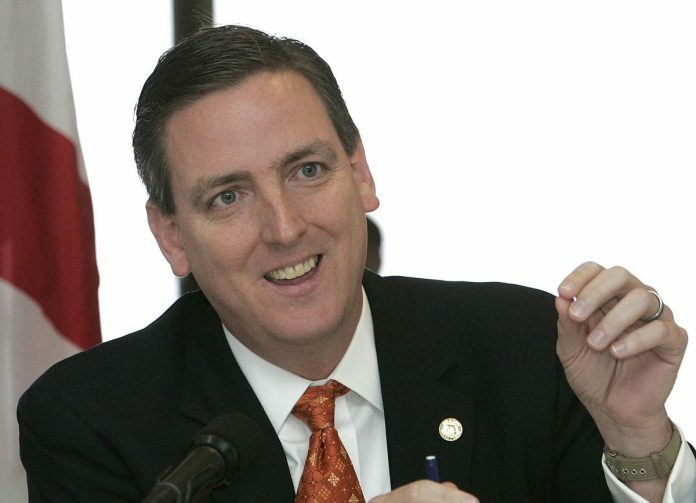 At the time, Ertel’s appointment was praised by both Republican and Democratic politicians as well as Democratic consultants who noted his lengthy tenure as a central Florida elections official. Ertel had yet to go before the state Senate for confirmation. DeSantis said Ertel regretted dressing up in blackface but was right to step down after the pictures surfaced. “I want people to be able to lead and not have any of these things swirling around,” said DeSantis, who was in Marianna to discuss relief efforts for areas hit hard by Hurricane Michael in October. “I don’t want to get mired into kind of side controversies,” said DeSantis, who weathered accusations of racial insensitivity during his race for governor last year. Democratic opponent Tallahassee Mayor Andrew Gillum questioned DeSantis’ association with people seen as racially divisive. DeSantis also came under fire when he said voters should consider Florida’s economy and not “monkey this up” by choosing the “socialist agenda” of broader public spending he says Gillum espoused. Rep. Scott Plakon, a state legislator from Seminole County and longtime friend of Ertel’s, called the sudden resignation a “huge loss” to the state of Florida. “As a personal friend, I’m heartbroken,” said Plakon and added that Ertel had a good reputation in his home county. He said he was surprised by the photos that surfaced. “There was never any hint of any bias against anybody. He just ran darn good elections,” Plakon said. But Ertel did play a role in DeSantis’ decision to suspend Palm Beach County supervisor of elections Susan Bucher last week. Ertel recommended the governor take action against the Democratic official, contending that she had violated state election laws and was incompetent. Democrats have sharply criticized Bucher’s suspension as being politically motivated. DeSantis selected Ertel at the same time he picked dozens of other high-level appointments before he came into office. The incoming governor assembled a transition team led by his campaign manager and included others such as U.S. Rep. Matt Gaetz that helped with finding people for the incoming administration. The northwest Florida Republican said Thursday in a text message that he “strongly” urged DeSantis hire Ertel but noted he had support from members of both parties. Then-Gov. Jeb Bush appointed Ertel as Seminole County elections supervisor in February 2005 and Ertel won four elections to keep the office. Ertel’s background includes an eight-year stint in the U.S. Army and public relations work for government agencies and a bank.